Angus Young of the 70’s, power-chord, testosterone drenched rock group AC/DC draws from a number of sources to attain his unique guitar sound according to “Gear Secrets of the Guitar Legends: How to Sound Like Your Favorite Players by Pete Prown and Lisa Sharken. In the book they describe Young’s signature traits, “massive finger vibrato, edge-of-pick-harmonics, and sublime blues feel” as well as the gear Young works with to get his classic rock tones, “Classic Gibson-thru-Plexi Marshall tone – not overly distorted, but with pronounced bass range.” What’s interesting is that although Young uses Plexis on top of the stage for live performances, he also runs his sound through a JTM45 in conjunction with an isolation box – which is all located under the stage. Maybe he’s not so simple after all? 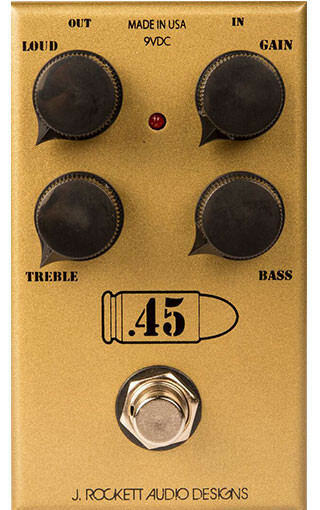 As part of their Tour Series pedal line the .45 Caliber Overdrive joins the ranks of other great pedals like the Tranquilizer, The Dude, Archer Ikon just to name a few. Like its predecessors, the .45 Caliber Overdrive comes in a single sized enclosure with 4-knobs for tonal control: Loud = Volume, Gain = Overdrive, Treble and Bass = exactly what you would image with those labels. The real question is did they succeed. We won’t really know that until we start to hear some reviews, but if this pedal is anything like the others in their vast line, then good things are coming this way. Let us know if you come in contact with the .45 Caliber Overdrive. If you do, leave a review at Pedal Finder so the rest of us can learn.